The Enterprise Ethereum Alliance has become the world’s largest open-source blockchain initiative. Since late May, the Enterprise Ethereum Alliance (EEA) has seen 34 organizations join the blockchain industry group. The total membership is more than 150 organizations since the group’s launch in February. The newest members of EEA include various business sectors like technology, banking, government, healthcare, energy, marketing, and Ethereum startups. 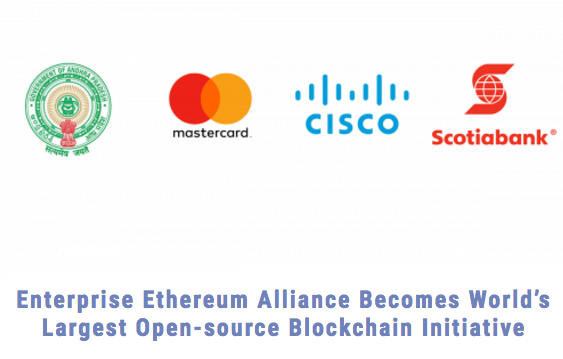 Some of the newest EEA members include: Bloq, Cisco Systems, TokenCard / Monolith, Cybersoft Digital Services Corp., Scotiabank, Government of Andhra Pradesh, and Amalto Technologies, to name a few. “EEA’s rapid growth in membership mirrors the accelerating acceptance and deployment of Ethereum blockchain solutions in the global marketplace,” said Julio Faura, chairman of the board for EEA. “The technological breadth, depth and variety of organizations coming together under the auspices of EEA to create and drive enterprise Ethereum standards bodes well for the future development of the next-generation Ethereum ecosystem. The Open Container Initiative announced an important milestone today with the release of the OCI v1.0 runtime and image specifications. The OCI was created to develop common, minimal, open standards and specifications around container technology without having to worry about being locked in. Today, the organization says that goal is becoming a reality with the image format specification and runtime specification. The image format specification focuses on the container image format, while the runtime specification addresses managing the lifecycle of a container. “It’s great to see Docker’s image format become enshrined in the OCI image specification. The flexible components work well in meeting a wide variety of use cases for distributing container images in a secure manner. With the release of the 1.0 specification, it will be exciting to watch the industry grow around these strong primitives,” said Stephen Day, senior software engineer at Docker. CA Technologies announced the results from its global study, “Continuous Testing as a Digital Business Enabler.” The report revealed while a majority of respondents (75 percent) highlight continuous testing as critical or important, only a minority of respondents have made progress towards acquiring the necessary knowledge and key enablers. Eighty percent of businesses are missing out on the full benefits of continuous testing, according to the study. 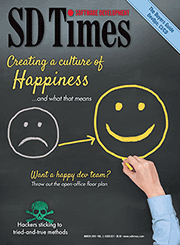 Other key findings including 20 percent of respondents identified as continuous testing leaders, and those leaders were 2.3x more likely to succeed in left-shifting testing, and 2.6x more likely to reduce defects by more than 50 percent. The latest version of Bitbucket Server 5.2 introduces project level administration, an additional tool for ensuring that compliance meets DevOps. With this feature, teams can meet compliance regulations without the burden of administrators having to constantly monitor the regulations. With Bitbucket Server 5.2, administrators can configure the branching model, the type of merge strategy used for pull requests, mandate that all commits be GPG signed and/or pushed only by the commit author, restrict branch access, according to a Bitbucket blog post. The new version of Bitbucket Server also comes with smart mirrors in Bitbucket Data Center, so global teams can speed up pull operations in high-latency and low-bandwidth environments. More information can be found here.